Canada Drugs is an online drugstore of Canadian origin. This shop, by far, is one of the oldest-running online drugstores in the market as the shop is on its 17th year in 2018. All in all, this pharmacy was able to gain plenty of reviews from consumers, both good and bad, as apparently, it was unable to please a hundred percent of its customers. Canada Drugs pharmacy is an online shop worth knowing considering its lengthy online service. Not all online drugstores are able to last more than a year, more so 17 years in the business. Unlike the other online drugstores, the Canada Drugs pharmacy appears pleasing without being overbearing and without overwhelming the buyers’ senses while browsing. The store featured modern improvements on its site while sticking to presenting only the most important details for its consumers. Canada Drugs is licensed by the Manitoba Pharmaceutical Association and is managed by Kris Thorkelson, who is also licensed by the Manitoba Pharmaceutical Association. Although the Canada Drugs company is based in Winnipeg, Manitoba, Canada, it supplied its clients with medicines from the New Zealand, Australia, and the United Kingdom, to be able to present quality and cost-effective medicines to its consumers. Canada Drugs also caters to customers in a number of countries including Canada, the UK, Australia, the US, Mexico, Brazil, and plenty other countries in the world. As for the medicines in this shop, Canada Drugs only supplies medicines to users with the appropriate prescriptions for the Rx medicines. On the other hand, the shop allows its buyers to purchase the OTC medicines without hassle. Almost all kinds of medicines are available at Canada Drugs, but consumers can’t expect the shop to send them narcotic medicines in spite of them having prescriptions for the products. Denis Chouinard gave the store 5 out of 5 points because of its efficient service. According to Denis, the store was able to ship his orders fast and without hassle. 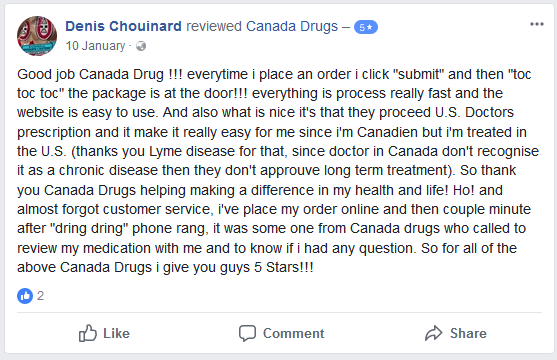 He explained that the store was able to accept US prescriptions for his medical condition and that Canada Drugs’ customer service was helpful and conscious of his needs. Jackson Basser, on the other hand, rated the store only 1 out of 5 points. According to him, he’s used Canada Drugs successfully in the past, but recently, he purchased a generic drug from the store but it did not work. To add to his dismay, Canada Drugs “refused to help” him with returns and in ordering the brand name drug. Because of his negative experience, he urged the other customers to use other web drugstores instead. 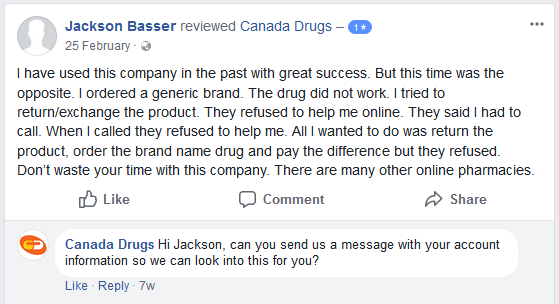 Canada Drugs responded to his comment and asked him to send the store a message so they can look into the matter. 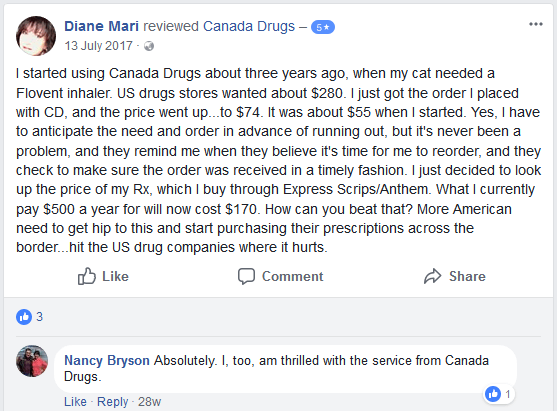 Not all customers had bad comments for Canada Drugs—most of its customer reviews were from satisfied clients like Diane Mari. According to her, she’s used Canada Drugs for more than 3 years, for her personal prescriptions and for her pet’s prescriptions. She mentioned being able to maximize her savings using the pharmacy instead of purchasing her meds from the US drugstores. Another buyer agreed with her and mentioned that she, too, was thrilled with Canada Drugs’ service. Joyce McFaddin also gave the store 5 out of 5 points and also related how she’s been ordering from the shop for years. According to her, customer service from this shop was “fantastic”, as well as its prices. The shipping turnaround time was also fast. Besides the customer comments from Facebook, the shop also had other reviews from its valued customers on other platforms. 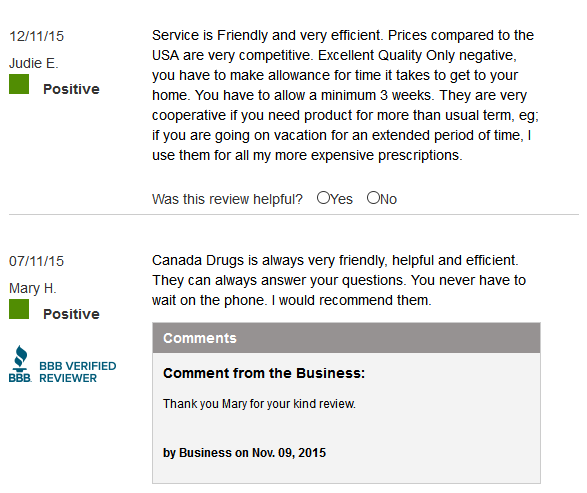 According to two reviewers who posted on BBB, Canada Drugs offered competitive prices and excellent customer service. Although one of the users, Judie E, mentioned that the products sometimes take 3 weeks to arrive, she still recommended the shop to other consumers. 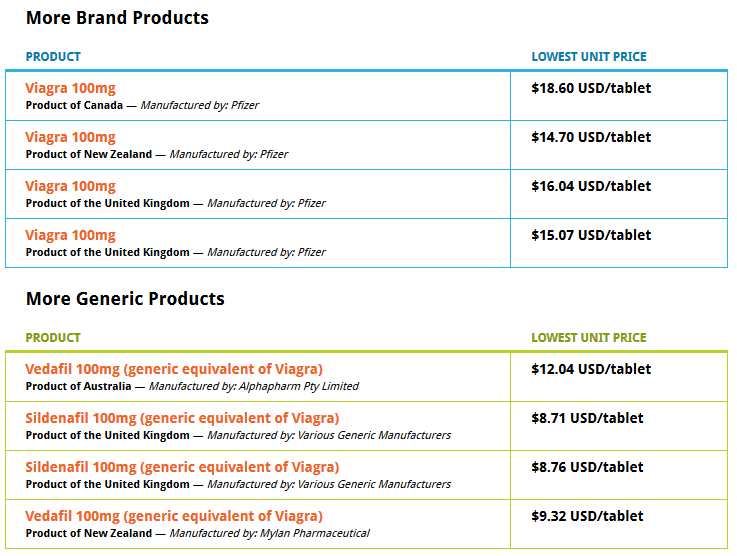 According to Canada Drugs’ price for Viagra 100 mg, 4 tablets cost $18.45 per tablet or $73.78. This is more inexpensive than most online drugstore prices, considering Viagra 100 mg often cost $50 or more per tablet. 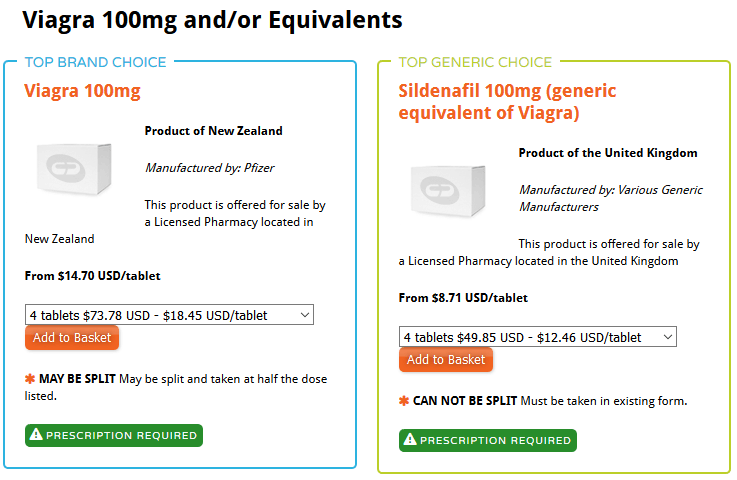 Generic Sildenafil 100 mg from various manufacturers, on the other hand, costs $12.46 per tablet or $49.85 for 4 tablets. According to the price list from Canada Drugs, Brand Viagra 100 mg tablets range from $15.07 to $18.60 per tablet, while various generic counterparts of Viagra cost $9.32 to $12.04 per tablet. These products may only be bought when the buyers have the prescriptions for the items. Canada Drugs, unfortunately, will close down soon. According to the store’s details, Canada Drugs will be shut down in July 2018 due to an agreement with the United States Department of Justice. The store did not mention moving to another domain and did not state why it’s closing down, but the store assured that it will fulfill all the pending orders until July 13. It’s such a shame to lose Canada Drugs, one of the oldest online drugstores in the market. This drugstore was able to provide good service to its clients, as reflected by its good reviews, but apparently, the good reception for the store is not enough to make it last forever. For alternatives to Canada Drugs, visit our list of TOP Online Vendors for the year, where you’ll find suitable stores that are as reliable as Canada Drugs.